Antique - Royal Cauldon "Victoria V7173" Pattern, Made in England, Produced in the 1930's, Total of (22) Pieces, Service for (6) Six. Cups are in the Floradora Pattern a matching pattern to the Victoria. This is an Intricate Multi-color Floral (Red, Orange, Yellow and Blue) enter-twined with Green Scrolls and Lattice. Plates are Scalloped with 22kt Gold Rim, 22kt Gold Stripe on the Inside of the Cups and on the Handles. 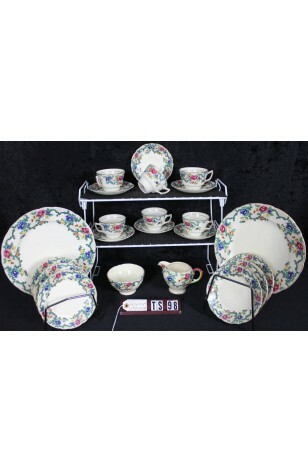 Cups are of the Victoria Sister Matching Pattern called the Floradora. 6 - Cups - 2 1/2"T x 3 1/2" W - Footed, "Floradora"